I hope you're all having a great October, my dears. 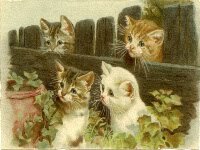 Here's a cute antique 1909 post card for you from my collection. Click to enlarge and right click and save. Also, congrats to the winners of my last two giveaways. The winners of my Belated 3 Year Blogoversary Givaway are Tanya Bartlett, Shtook, and Melissa. And the winners of The Vintage Fashion Journal Giveaway are ted and bunny and Rachael. Thank you to all who entered the giveaways and thank you to Laurence King Publishing for sponsoring The Vintage Fashion Journal Giveaway. You have the best postcard collection, this one is just gorgeous. Congratulations to the winners. Wishing you a lovely end to October, can't believe Christmas is so close! sorry, can't stop long to comment, too busy writing up my wonderful journal! Thankyou, I really really love it! Oh, what a sweetie! I cannot believe it's nearly November. The rest of the year will flash past. Happy weekend to you and you-know-who! What a very pretty vintage card, I also rescue and hoard vintage cards, postcards. Found you on Bloggers and I'm pleased I did, look forward to more of your posts. A really sweet blog, I've found some treasures we have in common!! I hope you are having a great fall Carla! Thank you for sharing the cute vintage kitten. Thank you for visiting and commenting! I love to read your comments! :) Best wishes, Carla.